Head back in time to an age of chivalry and honour, when knights in shining armour roamed the land on horseback and jousted for fun. 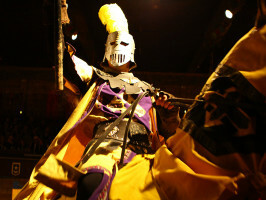 Yes, the middle ages are back with a bang at Castillo San Miguel in the southern Tenerife town of San Miguel de Abona. 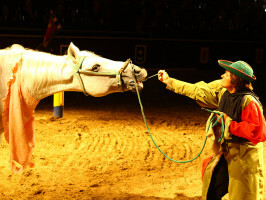 Be bowled over by the sights and sounds of this magical medieval show as the likes of Don Pedro Santoja del Coto and Don Ricardo Angulo de Urquijo battle for the honour of being the bravest and greatest knight in the land. After being greeted by Count Rodrigo of San Miguel castle, step inside this stunning recreation of a medieval fortress and admire the walls decorated with historical armour, swords, chests and scrolls. 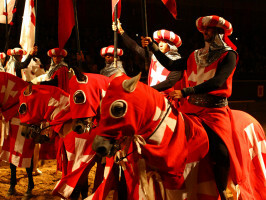 Behold the pageantry of the main event as the knights’ colour parties take to the arena to be presented to the audience before they begin their titanic tilts at each other. You will enjoy a medieval feast in every sense as you enjoy a delicious banquet – and just as they did back then, the soup is drunk and a chicken is eaten by hand. 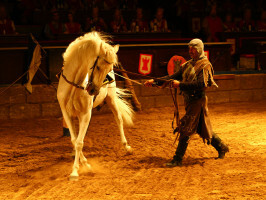 From your seat at the side of the vast tournament hall you will watch the knights perform the equestrian tricks, horseback tournaments and various martial games that were popular during the Middle Ages. The show ends with a great dance for the ladies and their knights. All events are held to the fabulous melodies of a grand orchestra, which plays until midnight. The doors open at 7pm. The show begins at 7:45pm. 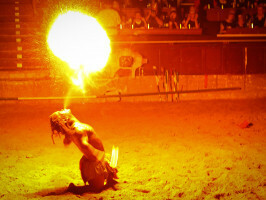 Medieval show: 2.5 hours + 1.5 hours of free time in the disco area where there is entertainment on offer. Meeting point: : Av. Edelmira Alfonso, S/N, Aldea Blanca , San Miguel de Abona.